This second Music by Me continues to play out the creative joy of the first. 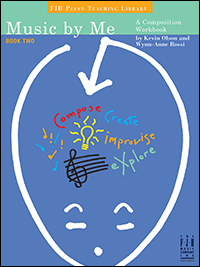 Book Two has the seven familiar units (rhythm, melody, harmony, bass patterns, musical form, modern music, and review), each divided into four: Tool of the Trade, Let's Explore, Improvise!, and Compose Your Own. Humorous and light touches abound, such as "Breakfast Food Rhythms," and "The Three Bears Improv," plus clearer references such as "Dominant Detective" and "Twinkle, Twinkle, Little Chords." 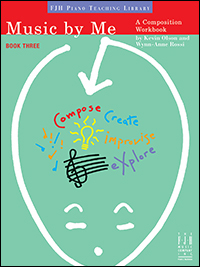 This third book continues the discovery of the tools used in composition. New concepts covered include: new rhythms (upbeats and downbeats), melody sequencing, harmonizing, theme and variations, and modern scales. 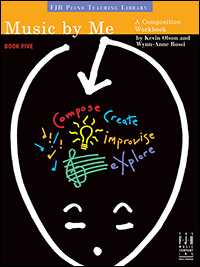 Music by Me, Book 4 contains six units designed for the early intermediate student. 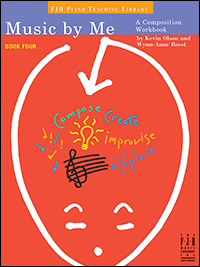 In this book, the topics covered include: syncopation, melodic non-chord tones, harmonic chord progressions, exercises in setting lyrics to music, 12-bar blues, and a discovery of modes. Book Five in this series is designed for the intermediate level student. Each unit is divided into four parts: Tools of the Trade; Let¹s Explore; Scanning the Score; Compose Your Own. Some of the unit topics included: compound meters; transposition; altered chords; modulation; extended forms; and experimenting with rhythm. 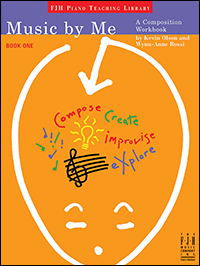 As with the previous books in this series, the goal is to unlock the student¹s creative potential and imagination.